Program Title: Presenting with Pizzazz, featuring Prezi! When advertising the program, request that parents sign children up for a free account beforehand. If possible, set up a few free accounts with library email addresses, for those who forget to create an account before the program. 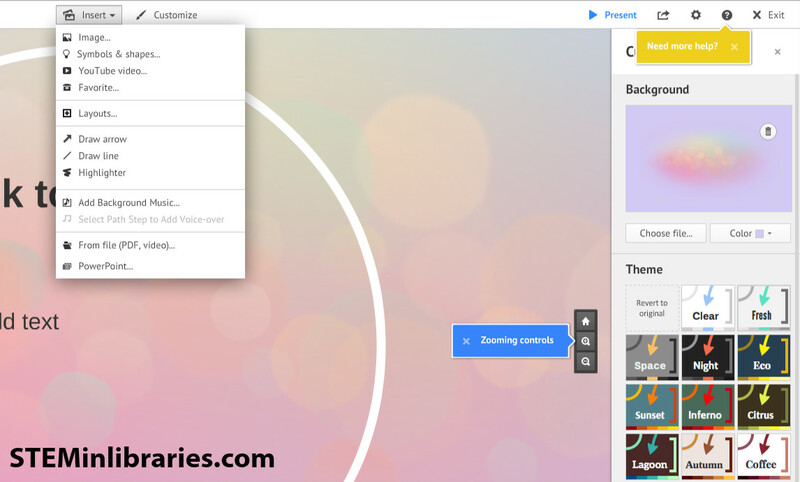 Create a sample Prezi to demonstrate what a Prezi is capable of. Explanation of Prezi. A good description we have heard of Prezi- from multiple sources, so our apologies for not having a credited source- is to think of it as a giant poster board, where you lay out all the parts of your presentation. Then you take a camera and move it across the virtual posterboard, zooming in on some parts and expanding away from others. Prezi is an incredibly easy and fairly intuitive program to use. Their online help and tutorials are a good place to begin if you are not already familiar with the product. For our classes, we first explained about the presentation path, located on the left side of the screen. From the path, we moved onto the Prezi canvas, showing participants how to add frames and text boxes, as well as how to customize the text boxes. With the frames, we showed how to insert images. As Prezi allows users to pull images from a Google search, we used this as a teaching moment to explain about copyright, and how to properly credit sources. We also directed participants to some of our databases that offer images to use. After the frames, we showed the Insert menu, followed by the Customize menu. Lastly, we ended with how to Save and share a Prezi. Since we first started offering this class, Prezi has changed the structure of some of its plans. It is now harder to have a completely private Prezi if you do not pay for it. Some schools have invested in the educational plans for Prezi, which does include advanced privacy options. Given the changed privacy feature, we would be sure to stress that, while free, Prezi is still public and to use with caution. We would not recommend this program for any group younger than 4th grade. As our original program was for 4th and up, this would work well for Teens, too, especially as an alternate option to PowerPoint.